Show disputed northern boundary of Maine. A New Map of Maine. A beautiful and delicate example of S. A. Mitchell's 1854 New Map of Maine. 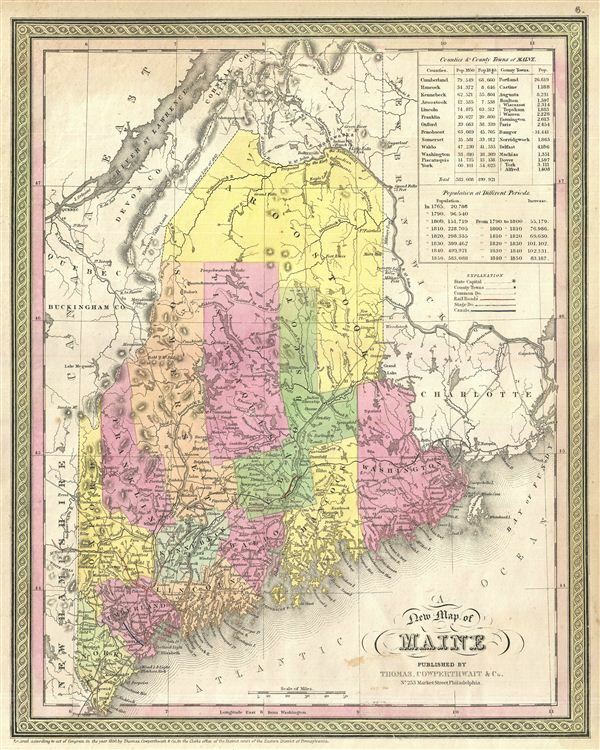 This rare map covers the entire state of Maine from the New Hampshire border to Passamaquoddy Bay, and northwards as far as the St. John's River. In the upper right quadrant an inset offers population data according the various censuses to 1850 in tabular format. The whole is engraved and colored in Mitchell's distinctive style with green border work and vivid pastels. Political and topographical features are noted and color coded with elevation rendered by hachure. After Maine became a state, carved out of Massachusetts in 1820, the northern boundary was disputed between the U.S. and Canada. The King of the Netherlands was appointed arbiter and settled the dispute with a new border of his own imagining. The first edition of this map issued in 1846, shortly after the 1842 treaty established the new Maine-Canada border – hence the map's title, 'A New Map of Maine.' This map shows several borders, including the post-Revolutionary War border of 1783, the line proposed by the King of the Netherlands, and, ceding slightly more land to Canada, the final 1842 boundary. Rumsey 4557.008 (1846 edition) Phillips (Atlases) 814.